BBC News Online profiles Derek Wanless, the author of a major report on improving the nation's health. Derek Wanless achieved brief notoriety in the "fat-cat director" scandals of the 1990s. 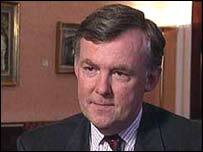 Mr Wanless was ousted as chief executive of NatWest bank in October 1999, after the once-mighty bank fell prey to a number of hostile takeover attempts from much smaller firms. He received a pay-off worth a reported £3m, one of the biggest "golden parachutes" ever seen in the City. Earlier this year, when Barclays shed its finance director and Abbey National's boss came in for criticism, both banks were accused of "doing a Wanless". Many shareholders blamed Mr Wanless for NatWest's demise. After being the High Street leader for much of the 1980s and 1990s, the bank was eventually swallowed by the Royal Bank of Scotland in 2000. A spirited defence against an earlier takeover attempt from Bank of Scotland was seen as the death-knell for Mr Wanless, exposing as it did NatWest's collapsing prestige and lack of investor confidence. Mr Wanless was seen as having driven NatWest into an ill-advised series of deals, in particular a foray into the highly competitive US market, and a move to expand its financial markets presence. Meanwhile, those of NatWest's competitors that stuck to the High Street retail business, in particular Lloyd's TSB, feasted on its market share. But Mr Wanless has not been universally reviled. A few commentators spared him from blame at the time of his ousting, pointing out that he had only been guilty of following what were then overwhelming trends in the industry. Indeed, he is seen in the City as an honourable man among many less so, a modest career banker of the old school. He worked in NatWest for his entire career, beginning with a Saturday job before going up to read mathematics at Cambridge. He has also worked extensively in charitable and semi-governmental organisations, shunning the well-paid collection of directorships enjoyed by most City leaders. Now, he is a non-executive director of small bank Northern Rock, and sits on the government's statistics committee. He is chairman of the Financial Services National Training Organisation and a Trustee of the National Endowment for Science, Technology & the Arts.